PRINCETON, N.J. — Americans’ views about the Affordable Care Act are more positive now than they were last fall, although overall attitudes remain more negative than positive. 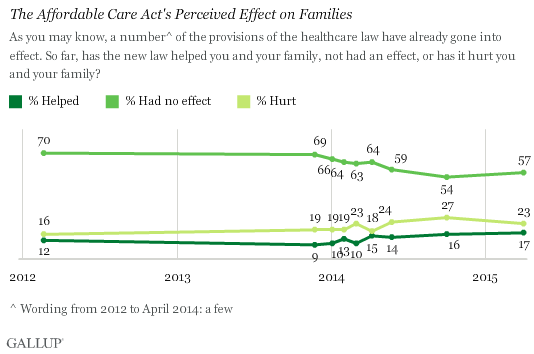 Half of Americans now disapprove of the 2010 law, while 44% approve — the narrowest gap since October 2013. By comparison, last November, just after the strong Republican showing in the midterm elections, 56% of Americans disapproved and 37% approved. Americans’ support of the Affordable Care Act has fluctuated substantially in recent years, reaching as high as 48% in November 2012, just after President Barack Obama was re-elected, and dropping to as low as 38% in January 2014 and 37% last November. The latest update, based on interviewing conducted April 1-4, shows that Americans have returned to the more positive evaluation of a year and a half ago — albeit one that remains net negative. The shift in attitudes over the past four months may reflect the public’s awareness of data showing that the percentage of Americans who are uninsured has dropped substantially since the ACA-mandated open enrollment periods for obtaining insurance began to take effect. Although opinions of the ACA have become somewhat more positive, Americans’ attitudes about the law’s impact on their own personal healthcare have not shown much change. 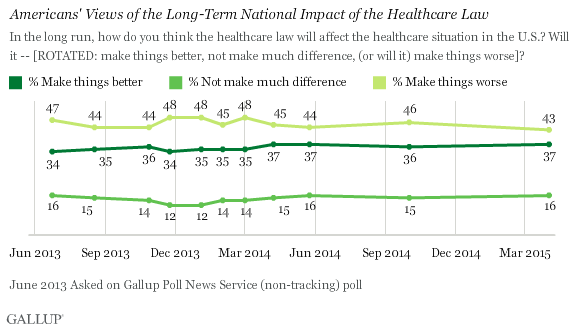 The majority of Americans continue to say the law has had no effect on their healthcare so far, while the percentage who say it has hurt their situation continues to be marginally higher than the percentage who say it has helped. The Affordable Care Act was partly designed to help those who could not afford insurance to get it, and the data show that several groups that are least likely to be insured — younger, lower-income Americans, minorities — are at least somewhat more likely to be positive about the impact of the healthcare law than others. -Americans aged 18 to 29 are slightly more likely than those who are older to say the ACA has helped their healthcare situation or that of their family, but almost one in five say it has made their situation worse. The ACA mandated that those under 26 could stay on or be added to their parents’ insurance policy, and provided subsidies for younger uninsured Americans to get insurance. On the other hand, the ACA created a requirement that all Americans have insurance, which could be responsible for some of the more negative evaluations among this younger group if they were forced to get insurance they did not want. Most Americans 65 and older are eligible for Medicare, yet three in 10 of this group still say the ACA has either helped or hurt their healthcare situation. -Americans with lower incomes have been less likely to be insured than those making more, and a slightly higher percentage of those making less than $24,000 a year say the ACA has helped their healthcare situation than is the case among those with higher incomes. 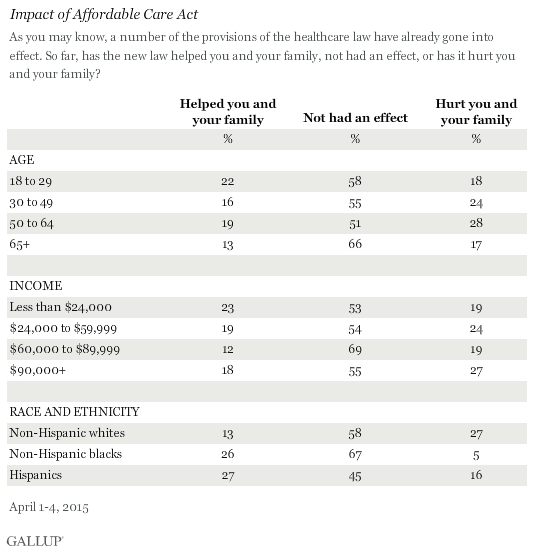 -Blacks and Hispanics are significantly more likely than whites to say the ACA has helped them and their family. When asked about the impact the ACA will have on their personal healthcare situation in the long term, 32% say it will make it worse — tying the lowest Gallup has measured. This reflects a decline from 38% in October, though these views have fluctuated over the past several years. 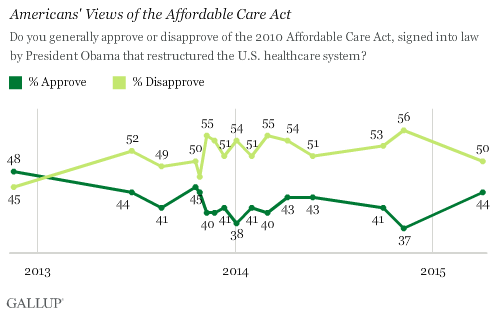 At the same time, the percentage saying the ACA will make no difference in the long run has gone up. About one in four say it has made their situation better, similar to prior readings. Americans’ views of the long-term impact of the ACA on the country have remained remarkably stable. In the most recent update, 43% say it will make things worse for the U.S. healthcare situation in the long run, while 37% say it will make things better. This six-percentage-point gap is identical to the gap in overall attitudes about the law. Throughout this controversy, Americans as a whole remain more negative than positive about the Affordable Care Act and its impact on their lives and the national healthcare situation. 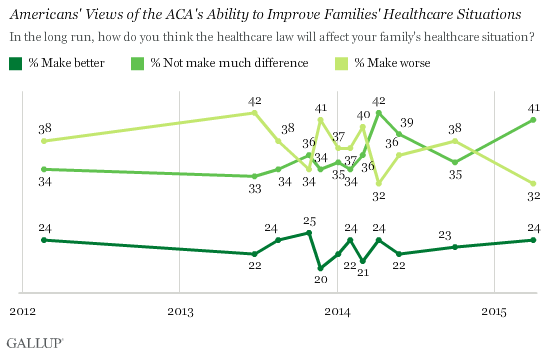 Views of the ACA, however, are modestly more positive than they were last fall. Americans who are more likely to be affected by the ACA, including young people, lower-income groups and minorities, are at least slightly more likely than others to be positive about the impact of the ACA on their healthcare situations, although significant percentages of most of these groups still say the ACA has hurt them. Results for this Gallup poll are based on telephone interviews conducted April 1-4, 2015, on the Gallup U.S. Daily survey, with a random sample of 2,040 adults, aged 18 and older, living in all 50 U.S. states and the District of Columbia. For results based on the total sample of national adults, the margin of sampling error is ±3 percentage points at the 95% confidence level. All reported margins of sampling error include computed design effects for weighting.